The 2nd annual Southern Maryland Balloon Festival supporting the United Way of Calvert County returns this year! If you were there last year you’ll definitely want to come out again to experience the fun festivities. If you missed it last year, this is one festival you or your family wouldn’t want to miss! This year’s SOMD Balloon Festival is packed with a load of additional fun activities and family-friendly events. Like last year’s event you’ll see tethered balloon rides, Maryland food truck vendors, live bands, evening balloon glow, and fireworks 🎆. New additions include artisan vendors, junior balloonist STEM demonstrations, and an expanded kid zone with interactive booths from local community groups; all to make this year’s event fun for the whole family. The Southern Maryland Balloon Festival kicks off at 3:00PM on the 14th of July 2018 at the picturesque water front Jefferson Patterson Park in Calvert County, MD. Everyone must have a general admission ticket to enter and all tickets must be bought online! Walkabout Balloon – Take a walk inside of a balloon. The balloon gets turned on its side and air filled by a fan. This tent like experience allows you to walk inside without shoes to really experience a hot air balloon up close! Tethered Rides – When the winds are calm the tethered ride gives you the expeirence of hot air ballooning while being firmly attached to the ground with a three-point rope system. You’ll get to go 60-80 feet into the air allowing for beautiful views of JeffPat and the Patuxent River. $25 Morning tethered rides are sold out and afternoon times are available on a first come first served basis for $20 per adult and $10 per child age 5-12. Junior Balloonist STEM Demonstration (3PM) – Children can enjoy a free demonstration of how hot air balloons work. 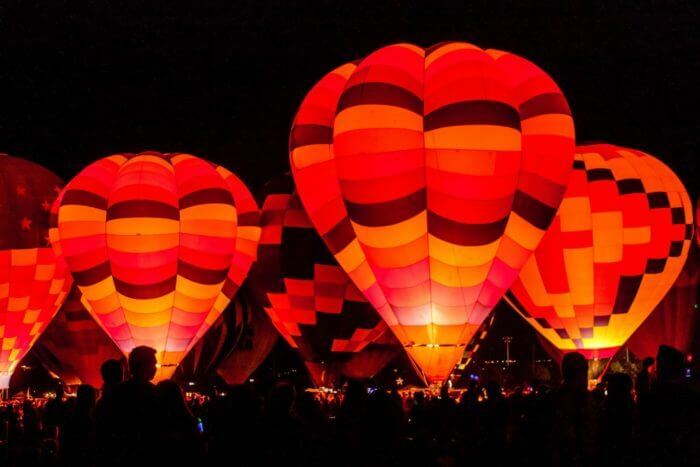 Balloon Glow (8:30PM) – Like a giant candle the balloons will fill the night with light and you’ll listen to an accompanying musical show. Being that this and outdoor event in the middle of summer we’d like to give you some insider tips on what to bring to the event to help you get the most out of it and keep you comfortable. Water – Sealed bottles of water are permitted and will help keep you hydrated, also available for purchase from vendors! Free parking is available on-site with courtesy shuttles for guests with children, senior citizens and mobility concerns. Handicap parking is also available. Free on-site parking at the event with courtesy shuttles for guests with children, senior citizens and mobility concerns. Handicap parking is also available. I look forward to seeing you at the Southern Maryland Balloon Festival!